It has been forever since my last post. I would love to say that it’s because I am too busy but the truth is laziness is the main reason :). Anyway, today post is going to be about Japan Digital Marketing Landscape. I am no expert in this subject so please feel free to comment. The below report is from Millward Brown for JP market in 2014, we could see that on average person in JP spends nearly 4 hours on laptop, smartphone and tablet vs 2 hours for TV. As expected, people switch between devices quite often, at about 35% use multiple devices at once. It looks like while people are watching TV, they use their smartphone at the same time, followed by laptop and tablets. 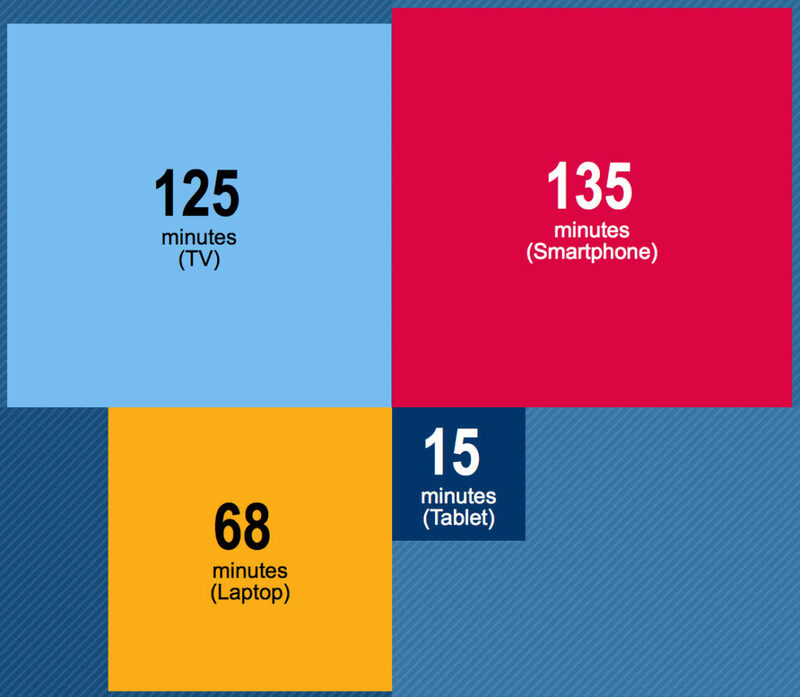 In total out of 2 hours of TV usage per day, about 90 minutes of usage is overlapped with smartphone, laptop and tablet. Internet users in Japan spend more and more time on smartphone to use social media, accessing media and entertainment apps. If you ask the question which activities keep people’s fingers glued to their smartphones in JP, they are spending time on social media (24%), playing games (16%), accessing entertainment (9%) according to study by Nielsen. 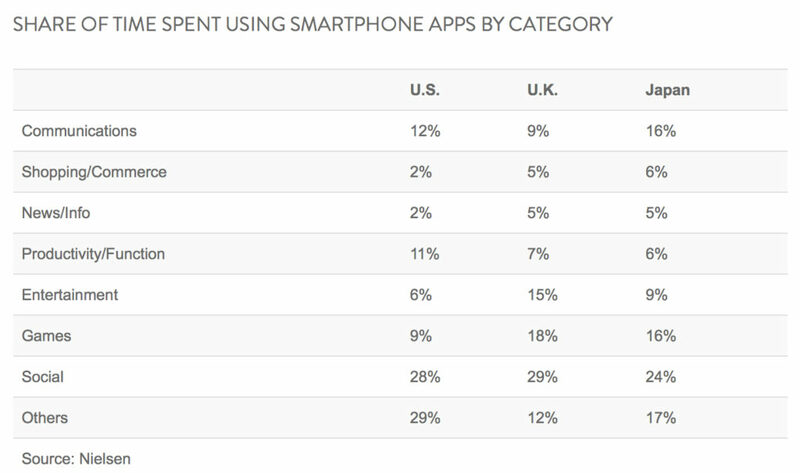 Users in JP also spend way more time with shopping and commerce app (6%) in comparison to people in US (2%) and UK (5%). Traditional phone functionalities while being still important make up less even smaller shares of Android user’s time, as users in Japan spend more time using instant messenger apps (7% total smartphone time) than text messaging (<1%). Favorability and Attention are important to brand advertisers. 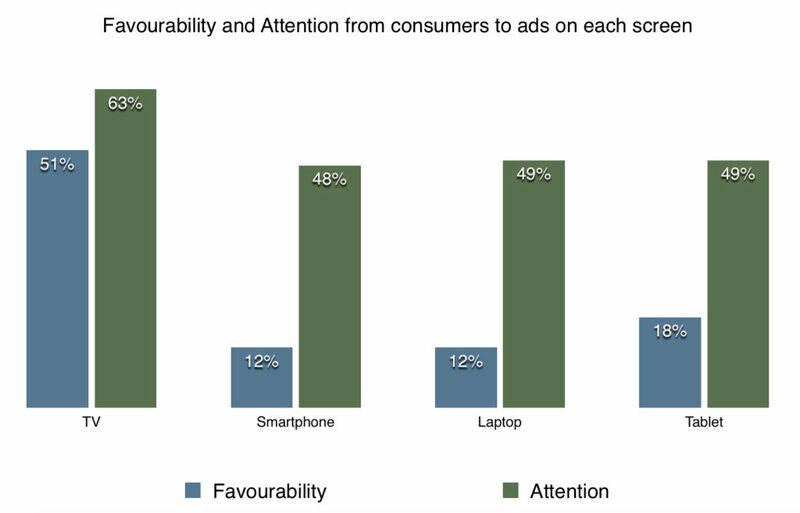 And it seems that consumers in JP are more open to engage and pay more attention to ads on TV compared to digital ads. This might explain why TV still commands a lion share of total ad spend in JP. The data below is from the same Millward Brown survey in 2014. I have to add that the data for favorability looks quite odd as it shows people are more open to engage with ads on TV vs digital devices. This could be something unique to JP but the difference still looks a bit odd. The latest report from comScore “Japan desktop video rankings” in Jun 2015 shows that YouTube attracted 51M unique viewers in Apr 2015, reaching nearly 70% of internet users in JP. The average videos viewed on YouTube is between 72 videos (for female viewers) and 80 videos (male viewers). According to the same report, the demographic profiles of viewers on Google and Yahoo follow the general demographic of internet users in Japan with 46.7% of viewers on Google age 45+ and 55.3% of Yahoo viewer age 45+. Dentsu (the biggest agency network in JP) publishes very detailed information about Japan Advertising Expenditures from 1999 until now. From the 2014 Japan advertising expenditure report, we could see the following information regarding the market share of TV, Magazine, Radio, Internet and other channels in Japan. Compared to 2013, Internet ad spend in Japan grew 12.1% to exceeded ¥1,051.9 billion (US $8.55B). Of this, internet media cost was ¥824.5 billion (or 78%) and online production cost was ¥227.4 billion. From the same report, within Internet ad spend, “performance-based advertising* spending amounted to ¥510.6 billion (up 23.9%)”. Performance based advertising includes Search Engine Marketing, ad networks, programmatic buys etc… While the terminology used is performance-based advertising, it does include both direct response ad spend and branding ad spend. 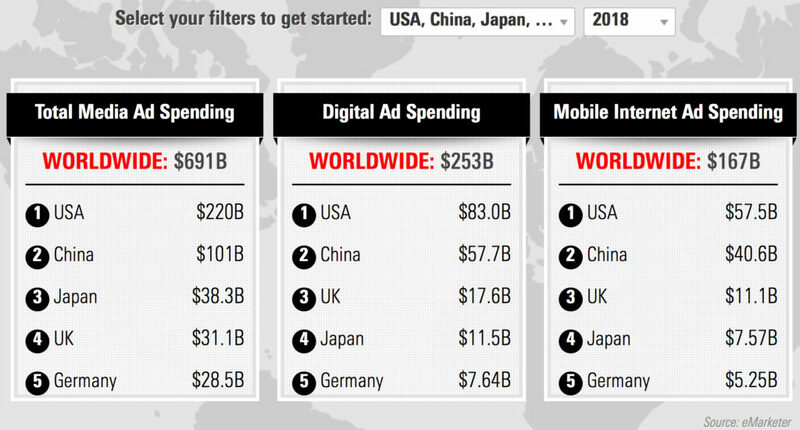 Data from emarketer shows that Japan 2014 internet marketing spend was at about $8.8B, ranked number 4 worldwide. Mobile marketing spend in JP was around $2.75B, again staying at number 4 position, behind US, CN and UK. There are small differences between numbers by Dentsu and Emarketer, which I suspect could be due to exchange rate difference. The forecasted internet ad spending and mobile internet ad spending in JP is at $11.5B and $7.57B respectively in 2018. It’s important to note that of the top 5 markets worldwide, JP mobile internet ad spending as a per centage of digital ad spending is on par with US, CN, UK and GR. 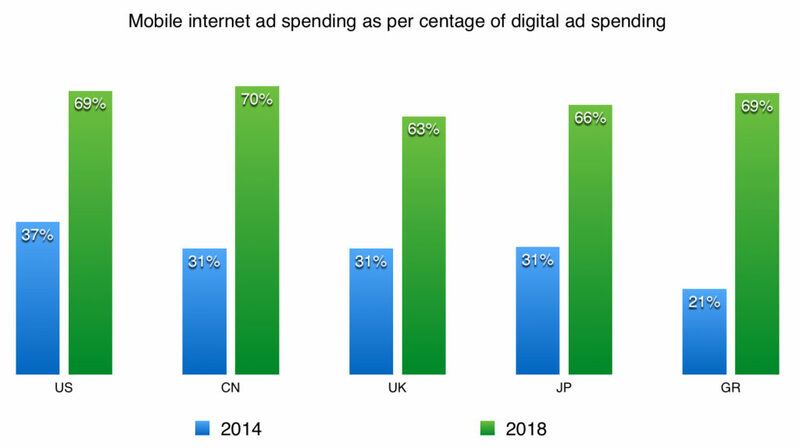 Mobile internet ad spending is forecasted to be 66% of the total digital ad spending in JP in 2018. That’s all from me for now. I may visit this again in Aug when we may have more information about top brands in Japan.